Analyzing the Best Molecular Hydrogen Tablets: Are You Being Lied To? The first question you should ask yourself when shopping for the best molecular hydrogen tablets on the internet is: Am I being lied to? The problem with internet search results for health-related products is they often provide zero links to scientific evidence. You end up reading a long list of purported, lofty benefits that trick you into buying a product. Believe me, I’ve been there. There’s no such thing as a magic pill or cure. Here’s a tip: don’t believe what someone says on the internet who has no scientific proof to back up his or her claims. There are only rare instances when someone is credible enough in his or her field to deliver solid information without scientific fact to validate his or her words. Since you’re here right now, the most important question is: Are molecular hydrogen benefits real? Without going too deep into detail, yes, they are. Here’s a link to a comprehensive review of 321 medical articles examining the positive effects of molecular hydrogen therapy on a myriad of ailments and diseases including cancer. First, I’ll share with you my picks for the best molecular hydrogen tablets. Then, we’ll take a deeper look at the benefits of molecular hydrogen therapy and why it’s so beneficial to the human body. Bio H2 by Nordic Clinical is a reasonably priced molecular hydrogen tablet that contains magnesium, malic acid, fumaric acid, and maltose. Once you drop a tablet into a bottle of water and close the bottle, the tablet converts into molecular hydrogen. Current users have reported a 1.0 ppm reading using Reagent test drops in 8 oz. of water. One woman reported that she and her husband have more energy and a better overall mood. She added that she’s slept “like a baby.” She noted that the effects took about a week to kick in. One gentleman said he feels like he’s “floating on air.” He recommends taking the tablets early in the day for improved mental alertness and more energy. Several users reported that they don’t like the taste. Quicksilver H2 is a more convenient molecular hydrogen tablet that dissolves within two minutes in an open glass of water. This product does cost more than the Bio H2 above, however, it delivers a much heartier molecular hydrogen dosage. One customer reported a ppm reading of 6.3. One gentleman shares this product with his family to improve their metabolism. He recommended dissolving the tablets in distilled water to get the most out of them. One person noted an increase in energy, which is the most common benefit most people experience. Another gentleman said this product is more potent than the others he tried. MegaHydrate is more than just a molecular hydrogen supplement. It’s helped many people reduce pain caused by inflammatory diseases including arthritis. The main function of this product is to work as an anti-aging antioxidant. I found one interesting review written by a gentleman who bought H2Blue Hydrogen Test Reagent drops to measure molecular hydrogen levels. First, he dissolved one tablet of MegaHydrate in 8 oz. of water. He then poured a 6ml test sample. The sample had a molecular hydrogen concentration of 9 ppm. One gentleman in his 70s who’s been using this product for 20 years noted that his increased energy feels natural unlike common stimulants used to boost energy. He reported that he’s had no colds for 16 years. Another benefit is a significant pain reduction in his aching hands. Another person said this product eliminated candida overgrowth. The person recommended starting slowly because of the severe initial detox symptoms. Here’s another solid molecular hydrogen tablet option manufactured by a company that’s done the research and clinical studies before slapping a label on their product. Ultra H2 offers a therapeutic molecular hydrogen dose of 4 to 5 ppm per tablet. Similar to the Nordic Clinical tablets above, Ultra H2 uses magnesium as its delivery system to produce molecular hydrogen once you mix the tablet with water. One person recommended Ultra H2 to speed up recovery after a hard workout. It’s also a good source of magnesium. Another woman reported increased energy and less joint pain. One gentleman noted improved focus and more energy at the gym. HydroActive™ is another reliable molecular hydrogen supplement that can deliver molecular hydrogen concentrations of up to 5ppm when used as directed. The company lists a dose of 400 trillion molecules of hydrogen per tab. Similar to the H2 Elite tablets, this tablet dissolves in an open glass of water. One woman takes two doses per day to boost her energy levels and “life force” without negative side effects. Another woman enjoys the convenience of dissolving the tablets in an open glass instead of inside a water bottle. She noted a more “sustainable” energy boost from this product than the one she gets from coffee. She also reported improved mental clarity and a sense of well-being. One woman gave these tablets to her husband to help him lose weight, and he lost 16 lbs. If you choose to take molecular hydrogen tablets on a daily basis, it’s important to make sure they’re delivering a therapeutic dosage of molecular hydrogen. If they aren’t, you’re pouring your money down the drain, literally. All the supplements I listed above have written reports by verified buyers who tested the tablets. However, if you’re anything like me, you may want to run your own test. The best way to test your hydrogen infused water is to use H2Blue Hydrogen Test Reagent drops. Click here or the image below to check out the product page at Amazon. Once you have the drops, simply follow the instructions to test the concentration of your hydrogen infused water. Each bottle of drops is good for 24 – 40 tests. If you’ve done your molecular hydrogen research, you’ve probably heard of Tyler Lebaron. He’s the Founder and Executive Director of the Molecular Hydrogen Institute. I think the most important takeaway from his explanation is that molecular hydrogen is a selective antioxidant, meaning it doesn’t just enter the body and destroy all free radicals. Through my own research, I found that molecular hydrogen has an amazing ability as an antioxidant to destroy harmful free radicals while leaving beneficial free radicals intact. There’s also synergy between alkaline ionized water and molecular hydrogen, which is why the most cutting-edge water ionizers on the market all boost molecular hydrogen levels. The anti-aging benefits of alkaline ionized water with molecular hydrogen are massive. While I do think molecular hydrogen tablets are an effective way to boost molecular hydrogen levels in the body, there are better ways to get the job done. Personally, I don’t like the idea of relying on a tablet or the need to buy a new bottle of something every month or so. I’d rather own a water machine that produces molecular hydrogen indefinitely. Through my research, I concluded that hydrogen water machines are less reliable than a quality alkaline water machine. The only one I found with consistently positive reviews was the one above. I think since hydrogen machines are still relatively new, the technology isn’t quite there yet. On the other hand, alkaline water machines have been around for decades, and the latest models have already begun including molecular hydrogen boost technology. If you’re interested in reading more about hydrogen water machines, click here to view the best machines currently available at Amazon. 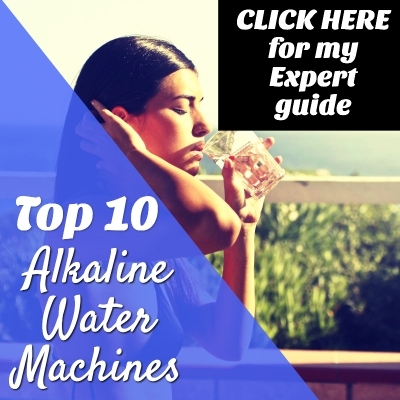 Since most of my knowledge lies in water ionizers, I’ll share with you a list of alkaline water machines that include molecular hydrogen boost functions in the next section. Early in my research on alkaline water machines, I found that the most premium water ionizers include a function for molecular hydrogen boost. This is what led me to my research on the health benefits of molecular hydrogen. All my top picks for best water ionizers include molecular hydrogen boost functions. The companies manufacturing alkaline water machines with built-in hydrogen boost for the most competitive prices are AlkaViva, Life Ionizers, and Tyent. Do note that the MXL series comes in six different models that range in price. All MXL series ionizers by Life include molecular hydrogen technology. Click here to view them all at Amazon. In my opinion, the best way to consume molecular hydrogen is to invest in one of the water ionizers above. You get a therapeutic molecular hydrogen dosage in every glass of alkaline ionized water you drink, and there’s no need to take pills or wait for pills to dissolve. The ionization process is also completely natural. Water ionizers use the minerals that are already in your water to boost molecular hydrogen. I don’t like the idea of adding anything to my water. I’d rather use what’s already in it to make it even healthier. I’d like to go over some of the health benefits of molecular hydrogen that people are experiencing right now. As mentioned in the previous section, molecular hydrogen is a very intelligent antioxidant. It has the ability to seek out harmful free radicals and neutralize them while leaving the beneficial radicals intact. There’s a lot of misconception around the thought of antioxidants. I remember when people first started talking about the anti-aging benefits of antioxidants. Science has come a long way since then, which is the reason people can stand behind molecular hydrogen benefits. What I find the most interesting is that a lot of molecular hydrogen health benefits are similar or the same as alkaline water benefits. In my opinion, most of the health benefits of ionized water and molecular hydrogen stem from better hydration. Our bodies are roughly 60% water. The human heart and brain are 73% water. It only makes sense that better hydration and healthier water make us feel better overall. Be careful when considering the best molecular hydrogen tablets. While I do think they work, I think there are better long-term solutions for consuming molecular hydrogen. The alkaline water machines I listed above provide you with molecular hydrogen in every glass of alkaline ionized water you drink. There’s no need to invest in monthly bottles of tablets or wait for the tablets to dissolve in water. I know water ionizers are a rather large upfront investment, but they pay for themselves in so many different ways. The question you must ask yourself is: How much is my health worth to me? A lot of alkaline water machine owners report that the reduced cost of medical bills alone has paid for their machines. When you combine the profound healing powers of molecular hydrogen and alkaline ionized water, you get the best of both worlds. Choose your molecular hydrogen supplement wisely.